Both destinations were present at this event organized by Travel Weekly and Travel Age West, where they interacted with 60 of the top-selling travel agencies in North America, continuing to consolidate the region’s tourism recuperation. 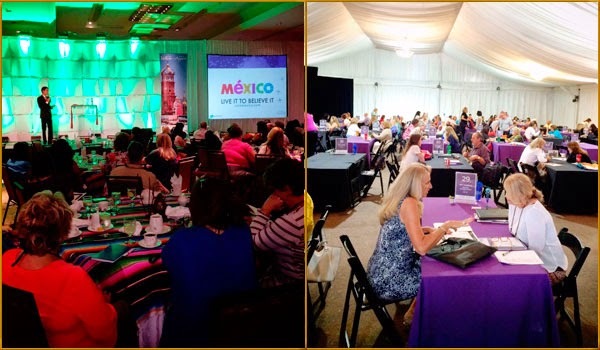 The Global Travel Marketplace (GTM) recently took place in Tucson, Arizona, where the most influential travel agencies in the western U.S. met with tourism providers including the Riviera Nayarit and Puerto Vallarta. The Riviera Nayarit Convention and Visitors Bureau (CVB) and the Puerto Vallarta Tourism Trust (Fidetur) showcased the best of the destinations’ high quality tourism services and their wonderful diversity in every category within this interactive platform. A measure of the importance of the agents with which they came in contact is the fact that out of 700 applications sent in to participate in GTM West, the organizers—Travel Weekly and Travel Age West—picked only 60. One of the minimum requirements was over $850 thousand in revenue per year, among other parameters. The event took place from May 1-3 and both the Riviera Nayarit and Puerto Vallarta elicited great interest among the participants thanks to the many attractions in each destination, but also for the excellent synergy they offer this particular area, which is their natural market par excellence. The support of the Mexico Tourism Board (MTB) was very much in evidence in the person of Gabriel Juárez, Administrator of the Los Angeles office; this served to emphasize the success Mexico has had in the tourism sector thanks to its joint campaigns, with Puerto Vallarta and the Riviera Nayarit being the best example. Travel Weekly and Travel Age West have always given our destinations a special place in their publications, highlighting the best of the region. This has had a very positive impact in our tourism thanks to their significant influence in North American society.